The latest innovation from SEIRIN, the J-15 is perfect for facial or auricular acupuncture, or wherever shallow needling is performed. Available in the thinnest gauges you can find (02, 01, and 1), this 15 mm needle comes with rounded guide tubes for accurate, gentle, painless and stress-free acupuncture. The J-15 also features ProPak technology, which allows you to open one or more blister packs quickly and easily. One surgical stainless steel needle per blister package. Features lightweight, color coded, 2.0 x 20 mm easy release comfort grip plastic handle with Light Touch Insertion. Sterile, disposable. Sizes 02, 01, 1 and 2 are for treatment of face, ear and other superficial acupuncture points. 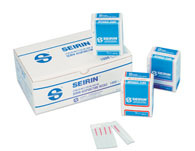 SEIRIN needles are of consistent, uniform, high quality finish. The world’s most popular acupuncture needle is now available in a user-friendly 10-pack. 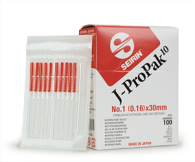 J-ProPak10 needles are made from the highest quality stainless steel and feature a lightweight, comfort grip, 2.0 x 20 mm plastic handle that is color coded for easy gauge identification. SEIRIN D-Type needles are a perfect choice for gentle, painless and stress-free acupuncture treatments where shallow needling is performed, such as distal veterinary points. Similar in style to the J-Type, the D-Type needle is available only in a length of 15 mm and does not have guide tubes, which make it ideal for freehand techniques. The color-coded 2.0 x 20 mm plastic handle gives the veterinarian a secure grip. 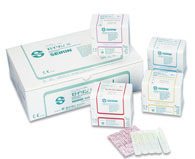 The Laser sharp L-Type needles from SEIRIN offer practitioners a painless choice for moxibustion or electro-therapy treatments. The L-Type features a flexible 1.3 x 20 mm metal spring type handle, optimal for conducting electricity and heat during use. It also provides the veterinarian with an enhanced grip, for a precise treatment. Made up entirely of surgical stainless steel, the L-Type upholds SEIRIN’s long tradition of innovation, quality, and safety. Each needle comes individually packaged with its own polypropylene guide tube, which is rounded on the end for patient comfort and is 100% PVC free. 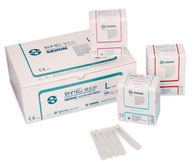 Used for both ear and body acupuncture points, Pyonex press needles (epi-shin) are a perfect choice for any treatment. Pyonex features the renowned painless insertion you have come to expect from SEIRIN. Manufactured with surgical stainless steel, the press needles contain a 2.8 mm dia ring handle and are available in three different lengths. Pyonex can be applied by hand or with tweezers, depending on your preference. Each press needle comes with its own 10mm x 10mm individual hypoallergenic skin tape and is mounted on easy-to-use rigid plastic holders. Each plastic holder contains 10 sterile needles. Herbsmith Rx can carry acupuncture needles in additional sizes to those listed above. If you are interested in purchasing a needle size not listed, call 800.624.64269.